Every gardener in our region anxiously waits for the first spring flowers to peek through the snow. Flower bulbs are among the plants that offer the earliest blooms in spring, and fall is the time to plant them. They can be planted anytime in fall up until the ground freezes, but for the best selection start choosing and planting your bulbs early. Plant flower bulbs about three times as deep as the bulb is tall, with the tip pointing upward. For the best appearance, plant bulbs in groups of five to seven, and avoid planting them singly or in rows. It works good to dig a wide hole, add bone meal and place the bulbs around the bottom of the hole. A rodent repellent for bulbs and compost mixed in the backfill soil are helpful for increased success. There are many varieties of flower bulbs with different blooming times. Often showing the first blooms of spring, crocus bloom in February or March – sometimes in the snow. They come in purple, pink, blue, yellow and white and are resistant to deer and rabbits. Daffodils bloom in April and are resistant to most every animal. They are available in several unique shapes and styles, mostly in colors of yellow and white, however some varieties are pink and orange. Tulips bloom in April and May. They are a favorite snack for deer and rabbits, so plant these only where animals are not a problem. Hyacinths are very fragrant and bloom later than most other bulbs, in May. They are resistant to deer, rabbits and other critters. 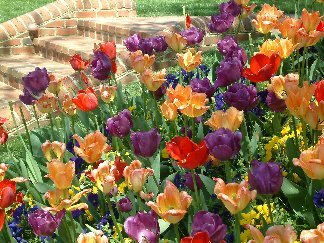 Give yourself a gift this fall by planting flower bulbs – you will enjoy “unwrapping” them when the warm spring winds start to blow and fresh color lights up your garden.